Reference number for this case: 4-Oct-54-Cazals. Thank you for including this reference number in any correspondence with me regarding this case. 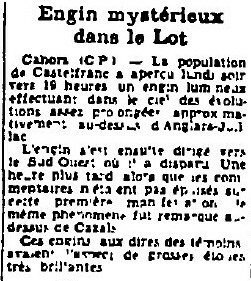 The regional newspaper La Dépêche du Midi for October 6, 1954, reported an observation from Castelfranc on 4 October 1954 at 7 p.m., noting that an hour later in Cazals the same phenomenon had been seen. It seems that in both cases people described what the newspaper calls a "craft", as having been similar to big bright stars. For Castelfranc, a direction of observation was given, pointing within the margins of error towards the planet Venus, which was however below the horizon towards 07:37 p.m.. For Cazals, no direction was given, I can just alert on the presence of Mars at 15° of elevation and the 210° direction. Cahors (C.P.) - The population of Castelfranc saw Monday evening around 7 p.m. a luminous machine performing in the sky quite prolonged maneuvers approximately above Anglars-Juillac. The craft then proceeded to the southwest where it disappeared. An hour later when the comments were not exhausted on this first manifestation the same phenomenon was noticed from Cazals. These craft, according to the witnesses, looked like big bright stars. In Castelfranc, I noted the possibility that it was Venus. In Cazals, it is not possible, Venus passed under the horizon at 07:37 p.m.
Mars is however there, towards the 210° of direction and the elevation of 15°, descending and passing under the horizon after 10:10 p.m.
[dm1] Article in the regional newspaper La Dépêche du Midi, France, October 6, 1954. 1.0 Patrick Gross December 28, 2016 First published. This page was last updated on December 28, 2016.